Well this was an odd little day, and it started the Thursday with this message on the Daggers forum. Well I couldn't let an opportunity like this pass me by so I called up Russell and put my name forward for the job. 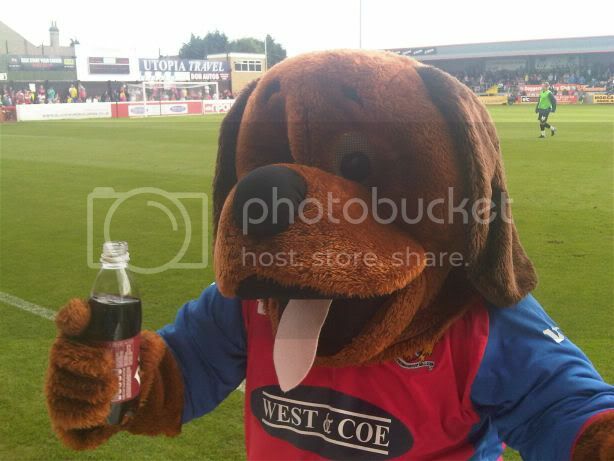 The next day I got a call telling me that for the first home match of the 2010/2011 season I was going to be Digger the Dog! It was nice to have a lie-in before the football on Saturday after the 2 away days. I came downstairs and watched the first hour of Soccer AM with a cuppa before heading out to Upney station to meet Nikos. The tube was messed up (as per usual) today, so rail replacement buses were the order of the day. After picking up some cash from the newsagent across the road, we headed down Victoria Road for the first time since the start of the season and while I have enjoyed the away trips this season, it has to be said, "There is no place like home!" First order of business for the day was; head into the clubhouse and watch the Arsenal Blackburn game. Chatting with the other Daggers in the bar the main topic of discussion was whether or not we were gonna lose star striker and all round Daggers legend, Paul Benson, to Charlton. 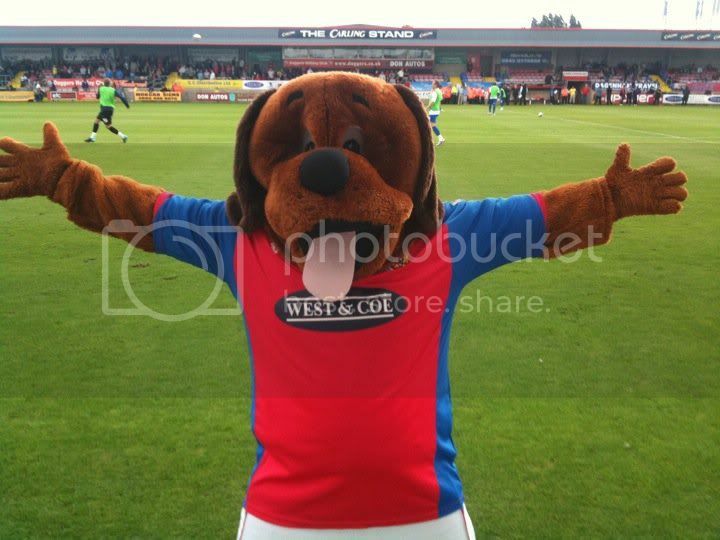 Mick (or "Digger the Dog" to me and you) found me and we went through my duties as mascot for the day. A couple of pints on an empty stomach had given me a distinct beer buzz so with half hour before I had to get the suit on I popped to the chippy and scoffed a pie (YUM!). Back at the clubhouse Mick had the big furry suit in 2 bags for me, so I sank a quick half and followed Mick. We walked past the turnstiles and into the gate beside them, then we walked pitch side in front of the carling stand (I took the opportunity to pat the roof of the home dugout as we walked past) then into the old players tunnel and through into the old home dressing room. I was pretty damn cool to sit in the room that was once the changing rooms to so many Daggers legends. 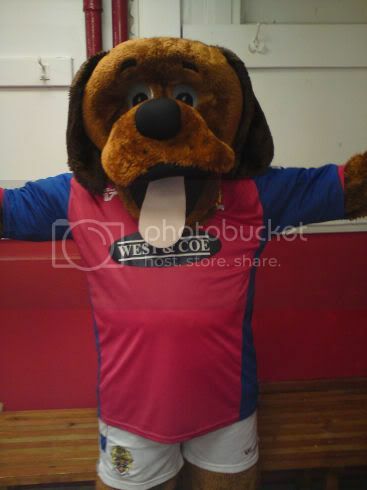 I put the suit on, picked up my bucket of sweets and headed back down the tunnel and onto the pitch to hand out sweets to the kids that were gathering at the edge of the pitch. 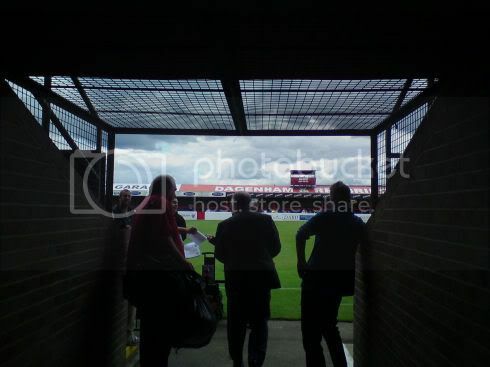 After walking around the pitch and posing for a couple of photo's (including one with 2 Tranmere kids) I walked down the new players’ tunnel in the Marcus James stand and took my head off. It was mad seeing all the buzz of the teams getting ready for the match and even the Gaffer himself John Still shook my hand and wished me luck for the day! As the teams lined up in front of the tunnel I put my head back on and waited to take my place at the back of the line of players. As the last players headed for the tunnel Mick told me to "Just follow Josh" so looking through the mesh eyes of digger I kept the name "Scott" on the back of Josh's shirt in view and headed out onto the pitch. We all lined up and then I shook hands with all of the Tranmere players then headed back into the old changing rooms, Got back into my street clothes and Mick Lead me back into the ground and I went and found my mates in the sieve. I had only missed a couple of minutes and we were on the attack and it was looking good for the Daggers, We had some good shots, including a couple of lovely tries from Benson. The sieve was quite noisy today and most were up for a song, including a few started by myself. The sun was shining and I could smell the burgers being cooked behind me. it felt like a good early season game. I had been keeping an eye in the time as I had to get back to the dressing rooms with enough time to get back in the suit and onto the pitch for the half time break. 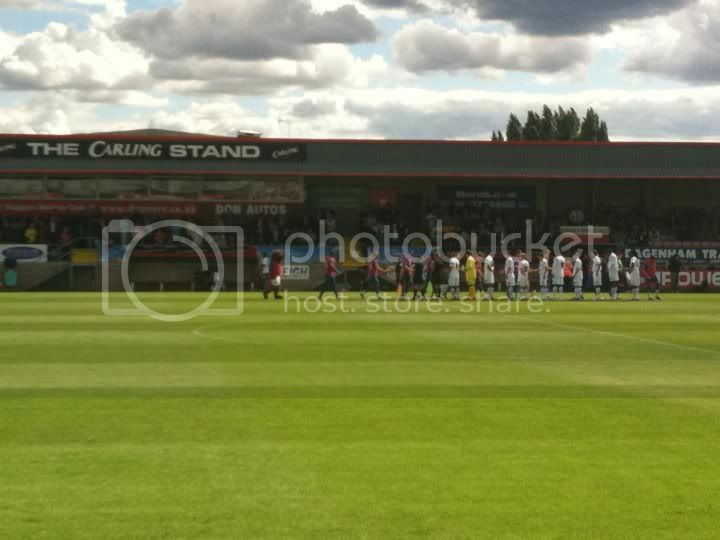 So as the clock struck 30 minutes I headed round the terrace and back into the changing rooms. Now one thing I’d been told about the Digger suit is that it was very warm in there, and even though I hadn't really noticed being warm, I must have been because the sleeveless shirt I had worn underneath was pretty damp when I pulled it out of my bag!! With the suit on (but not the head) I waited at the end of the tunnel for the half to end. While I was there a woman in a daggers staff uniform said "I read your blog, you're the FullMetalDagger" so it's always nice to know that people read my scrawlings. The whistle went and I headed out onto the pitch again, without my bucket I was free to play up to the crowd a bit more also there were a lot more people than when I first went out. 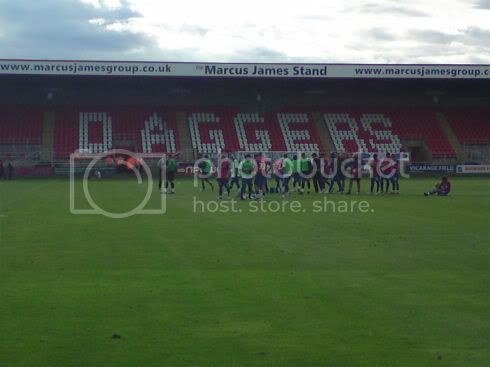 So I did my little bit to try and entertain the crowd, shaking hands and getting hugged by half of the Daggers kids team who were on the pitch at the time. A few people either knew or had hear there was a different digger today and you could hear "hey there Digger junior!" and "Digger you lost any weight?!" from inside the head. As I got round to the area where my friends were I played it up to them and posed for photographs but disappointingly MrsMetalDagger wouldn't give me a hug!! after a few photo's and being fed a burger by one of the kids in the stand as I headed back across the pitch my mates were chanting "DIGGER DIGGER!" so I jumped round and cheered at them then one last time before heading back into the tunnel, my job for the day done. Once out of the suit I thanked Mick for what I found a very fun experience and headed back to the sieve. So we're onto our first 3 points!!!! Me and my big mouth again! It just wasn't meant to be and on 78 minutes Enoch Showunmi put it in the far corner past Robbo, 2-1! But if I’m honest I was still sure we had the three points sewn up as Tranmere had been second best all day. This didn't stop the Tranmere fans waking up and having a little sing-song and sadly they had more to sing about 1o minutes later when one of their players was brought down for a free kick on the edge of the box (I thought it was going to be given as a penalty!) Aaron Cresswell put in a very good strike that flew into the far side of the net for the equaliser! The Tranmere fans exploded into cheers knowing they'd rescued a point and people started to walk past me and towards the exits. Daggers continued to battle on but it was to no avail 2-2 full time and think it’s fair to say the Tranmere fans went home the happiest. But I am looking on the bright side, we have 1 point and we are no longer rock bottom of the table. If we continue to play like we did we will pick up points!